For decades, Washington Apple Pi has started meetings with a Question & Answer period, and for almost 25 years, the usual moderator of these sessions was Lawrence Charters. He liked to have 8-15 questions per session, which averages out to two to three minutes for both the question and the answer. He also preferred questions on a variety of topics. Two topics caused consternation: printers, and email. In summary: printer questions didn't lend themselves to quick questions and quick answers. But email questions were even worse. Email questions also seemed to be contagious. In addition to having overly vague questions, with important details slowly revealed like hints in a live-action crossword puzzle game, email questions also seemed to generate even more email questions. Lawrence observed that, as soon as one person asked a question about email, it seemed that all subsequent questions were about email. He would often preface a Question & Answer session with a plea that no one ask about printers — or email. When Lawrence retired as the Q&A moderator in November 2017, this video compendium was presented to him as a gag gift. 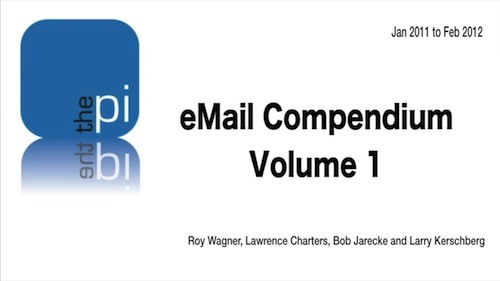 Titled eMail Compendium Volume 1, it consists of nothing but email questions asked between January 2011 to February 2012. The moderators during this stretch were Roy Wagner, Lawrence Charters, Bob Jarecke, and Larry Kershberg. You can watch the entire clip (or download the clip) in one piece, or in two sections.